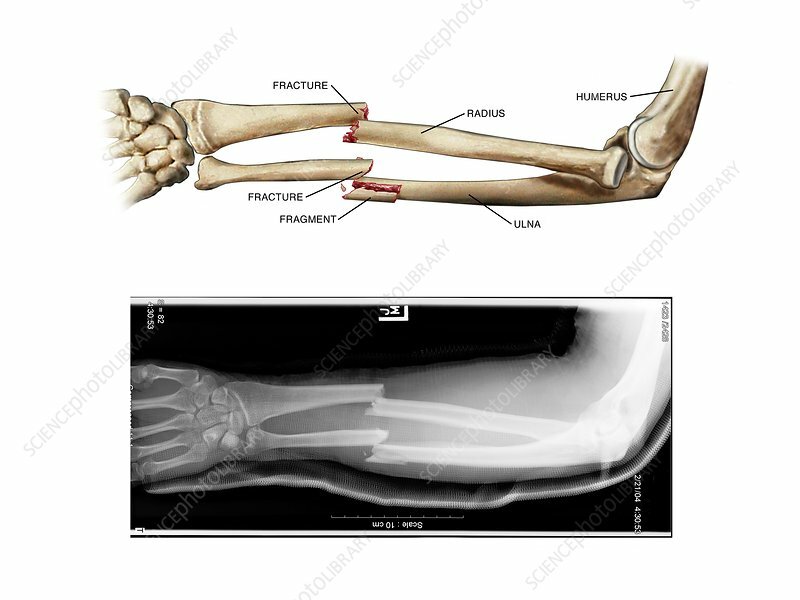 Comminuted fractures of arm bones. Labelled artwork and corresponding X-ray of comminuted fractures of the shaft of the radius and ulna bones in a patient's left arm. A comminuted fracture is where the bone has broken into several pieces. This is a dorsal view, showing overriding of both fractures (the fracture points have slipped past each other). Surgery will be needed to fix the bones in their correct alignments to allow them to heal. This is usually done by implanting metal plates fixed with screws, though for more complicated fractures, wires, pins and rods are also used.